Undersea explorers often liken the dark depths beneath the waves as to another world. And indeed, looking out at the ocean can conjure the same feelings of awe and humility as gazing up towards the night sky, unimaginably vast, seemingly infinite, just beyond our reach. But unlike outer space, we know the oceans holds life -- intelligent life at that, and our presence there is being felt. No other creatures stir our sense of wonder quite like our ocean-going mammalian counterparts: whales, dolphins, and porpoises. These denizens of the deep have a been a source of wonder for centuries, inspiring a sense of distant kinship unparalleled by any other non-human animal. It's not surprising then that whale-watching tours have become a $2 billion a year industry. 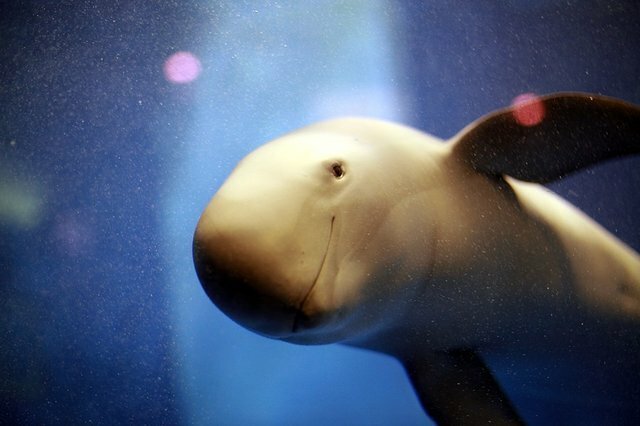 In human terms, it could be said that cetaceans are among the most profitable celebrities on the planet. On occasion, however, instead of having to venture out to see them, they come marching in to us, blurring the perceived borders of our two worlds -- though it should remind us that there really aren't any. This week, a group of about 50 pilot whales, a common species to U.S. waters, became stranded in our Everglades National Park -- captivating the nation with their news-making struggle. Rescue crews arrived on the scene to usher them back to sea as the public watched, panged with sadness as reports arrived that many of them had perished. Meanwhile, little if any mention is made of the species' more pressing threats -- like from ocean pollution or hunting; Nearly a thousand pilot whales are killed each year in a traditional hunt on the Faroe Islands in Denmark. Still, news of encounters with these animals arriving close to where we live isn't always grim. Today, a pod of harbor porpoises were spotted swimming in the River Thames in central London, an unusual occurrence but not harmful to their survival. The animals, which have since disappeared from sight, are believed to have been pushed upriver by a storm surge -- but their brief foray into the heart of the metropolis spurred more interest in the species than they usually receive elsewhere. Another famous example occurred in 1985, and again in 1990, when a single humpback whale, named Humphrey, made a similarly wayward journey into San Francisco Bay, in the first instance swimming miles up into the tributary Sacramento River. As biologists worked to coax the animal back downstream, Humphrey's misadventures became media fodder -- with thousands of concerned TV viewers tuning in to watch his saga unfold and spectators collecting along the shore to urge him on. Fortunately, Humphrey survived the two occasions unscathed. But for every whale, dolphin, or porpoise that whose plight or wanderings capture the attention of humans, there are countless others in the wild who perish, without a name, due to human threats. Given our profound fascination with them, cetaceans will likely always make news when they appear along our waterways, and for good reason. But the same concern for the well-being of these animals shouldn't diminish as they slip back out of sight into the depths of the ocean -- rather, it should be redoubled, as that is where it's needed most.